The departure gives President Trump a second opportunity to fundamentally alter the nation's top court for decades. Justice Anthony Kennedy, a crucial swing vote on the Supreme Court, announced Wednesday he's retiring at the end of July, giving President Donald Trump another chance to fundamentally reshape the highest court in the land. In a statement, the Supreme Court said the 81-year-old Kennedy will step down effective July 31. The judge called it "the greatest honor and privilege to serve our nation in the federal judiciary for 43 years, 30 of those years in the Supreme Court." Kennedy wants to spend more time with his family, even though they were content with him staying on the court. "For a member of the legal profession, it is the highest of honors to serve on this Court," he wrote. 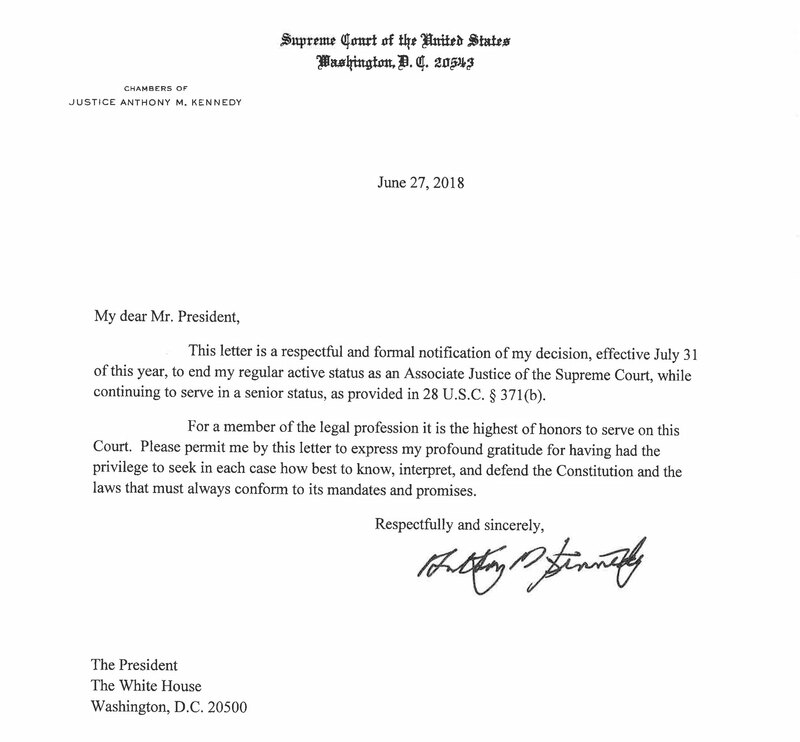 "Please permit me by this letter to express my profound gratitude for having had the privilege to seek in each case how best to know, interpret and defend the Constitution and the laws that must always conform to its mandates and promises." Speaking to reporters Wednesday, Trump called Kennedy a "great justice" who has displayed "tremendous vision and heart." He said a search for his successor will start "immediately." The president's first nominee to the court, conservative Justice Neil Gorsuch, has already had an enormous effect on U.S. policy in narrowly decided rulings this week related to Trump's ban on travel from certain countries, abortion and labor unions. The president said his next choice would come from a previously released list of 25 candidates. Possible candidates when Trump chose a replacement for the late archconservative Antonin Scalia included Appeals Judges Thomas Hardiman and William Pryor, among others. Senate Republicans will try to fill Kennedy's seat before November. Majority Leader Mitch McConnell said Wednesday "we will vote to confirm Justice Kennedy's successor this fall." McConnell blocked then-President Barack Obama's nominee to fill Scalia's seat, Judge Merrick Garland, clearing the way for Trump to nominate Gorsuch. Kennedy's retirement foreshadowed tension ahead between Senate Republicans and Democrats. Senate Minority Leader Chuck Schumer said Wednesday that Republicans "should follow the rule they set in 2016, not to consider a Supreme Court Justice in an election year." McConnell has made a distinction between presidential and midterm election years. "No union is more profound than marriage, for it embodies the highest ideals of love, fidelity, devotion, sacrifice and family," he wrote in the majority opinion. "As some of the petitioners in these cases demonstrate, marriage embodies a love that may endure even past death. It would misunderstand these men and women to say they disrespect the idea of marriage. Their plea is that they do respect it, respect it so deeply that they seek to find its fulfillment for themselves. Their hope is not to be condemned to live in loneliness, excluded from one of civilization’s oldest institutions. They ask for equal dignity in the eyes of the law. The Constitution grants them that right." However, in the 2012 ruling that upheld Obamacare's individual mandate requiring Americans to obtain health insurance, Kennedy sided with the conservative dissent. He said the court's majority "regards its statutory interpretation as modest. It is not. It amounts to a vast judicial overreaching. It creates a debilitated, inoperable version of healthcare regulation that Congress did not enact and the public does not expect." The justice left a parting message of sorts in a concurring opinion he wrote this week when the court upheld Trump's travel ban in a 5-4 ruling. He was the only justice signed on to the opinion.